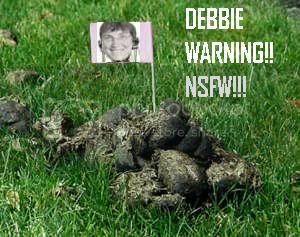 Teh Daily Squeak: Deb Frisch Manure Duty 2009! Deb Frisch Manure Duty 2009! SHE CAN SPEW IT, BUT CAN'T CLEAN IT UP!! a "violation of civi[LOL] rights." what I have heard about it." corpses. These are violations of people's civil rights." you get a taste of your own medicine! Deb Frisch!" wailed I.B. Ded, zombie counsel to teh ACCLU. And she claims all of this is retribution for her being a "whistleblower"? Well, 'whistleblower' in the sense that she's a stalker who assaults people. Daily Squeak, your coverage of this ongoing train wreck is worthy of a Pulitzer. ^nah. Teh Daily Squeak isn't revealing secrets that will help our enemies. As for the "whistleblower" line, it is obvious that she has not learned her lesson. Wait, that's three words. You got a free word, Debnack. That extra word will go nicely with your syringes. Her caliming to be the equivalent of Lech Walesa is an insult to those who did suffer for speaking their minds, and not for getting drunk and assaulting people. Also, why is it I am reminded of Homer Simpson's claim that he was a political prisoner when he was in the lock-up at Itchy and Scratchy Land?